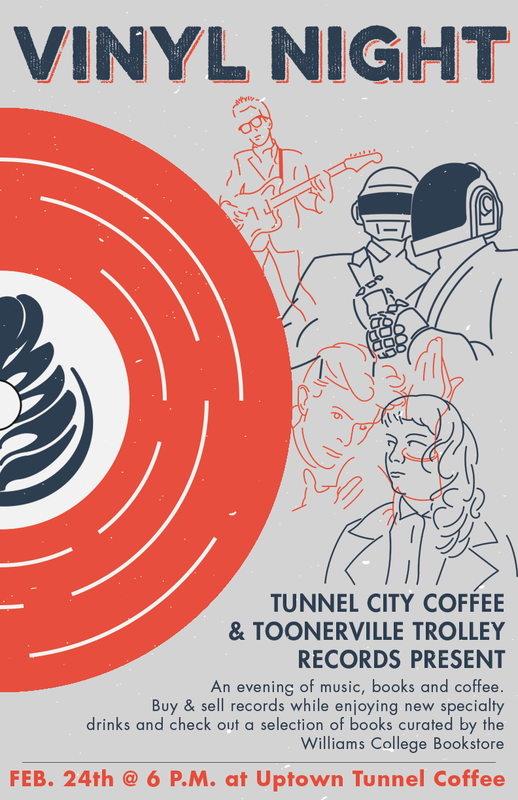 Tunnel City Coffee welcomes the public to escape cabin fever with an evening of great coffee and great music at its newest Williamstown cafe, Uptown Tunnel Coffee at 81 Spring St., on February 24 from 6-8pm. Uptown will launch its first menu of specialty mocktails during Vinyl Night, which will become part of Uptown’s permanent offerings. Williamstown staple Toonerville Trolley will also sell records from its collection, as owner Hal March works to sell off most of the precious vinyl he’s amassed over the years. Coffee and vinyl go hand in hand, so it was only a matter of time before they came together at Uptown Tunnel Coffee. Folks joining in on Vinyl Night will find punk, free jazz, reggae and industrial noise records for sale. March prides himself on offering music for every kind of listener, from heavy grunge to soft jazz. Like thoughtfully prepared specialty coffee, there is a unique and valuable quality to a vinyl record that other music media cannot match. With such a deep appreciation for music in the northern Berkshires, as shown by the annual Solid Sound Festival, FreshGrass Festival and the powerful presence of jazz, chamber and world music at Williams College, Uptown Tunnel Coffee looks forward to celebrating our collective history in vinyl with local musicians and music disciples. WILLIAMSTOWN — May 22, 2017 — One way to make residents feel at home at Sweetwood of Williamstown Retirement Living Community is for them to get their favorite coffee without having to drive to get to it. That’s why Tunnel City Coffee now serves residents coffee and pastries in their Sweetwood Café. On the first floor of Sweetwood, directly across from the front entrance, a variety of homemade pastries and different blends of Tunnel City Coffee will be offered on a daily basis. The coffee will also be available during select events hosted by the community. The demand was apparent when administrators noticed how many residents and how often they get together at the Spring Street coffee shop. While the staff enjoys seeing the same round table occupied by six to eight gentlemen enjoying a cup of specialty coffee every morning at 11 a.m., the group now has the opportunity do so in their own living quarters. Sweetwood of Williamstown, located in Williamstown Massachusetts, is situated in a quaint and renowned arts and education community in the spectacular Berkshires. It is an assisted living facility that offers one and two bedroom apartments with full kitchens, large bedrooms and walk-in closets with a flagstone patio, a greenhouse and a 24-hour on-site health center. Sweetwood is more than a retirement community — it is home. Sweetwood is located at 1611 Cold Spring Road in Williamstown. For more information call (413) 458-8371 or visit sweetwoodliving.com. Tunnel City Coffee has been pulling espresso shots in the small college town of Williamstown since 1992. Along with making top quality espresso drinks, Tunnel City is known for roasting specialty sustainable green coffee in the Berkshires with trails, streams and timeless vistas as a backdrop. Beans are purchased from various developing regions and grown by small farmer owned cooperatives and selected for its above average quality — sold by the pound or brewed in the energy and vibrancy of Spring Street. The company is also a purveyor of pastries made daily in its scratch bakery. Over the past 25 years, the company has grown in sales, location and employee base. With the addition of a cafe on the MASS MoCA campus, Tunnel City Coffee will begin serving beverages out of the new Spring Street Bookstore in the fall. For more information and to learn more about retail and wholesale opportunities, visit TunnelCityCoffee.com or call (413) 458-5010.